Join us in Norwich for the peace vigil on Sat 2nd March from 12-1, at St Peter Mancroft Church. Banners, posters and flyers welcome. Come for as long or short as you like. 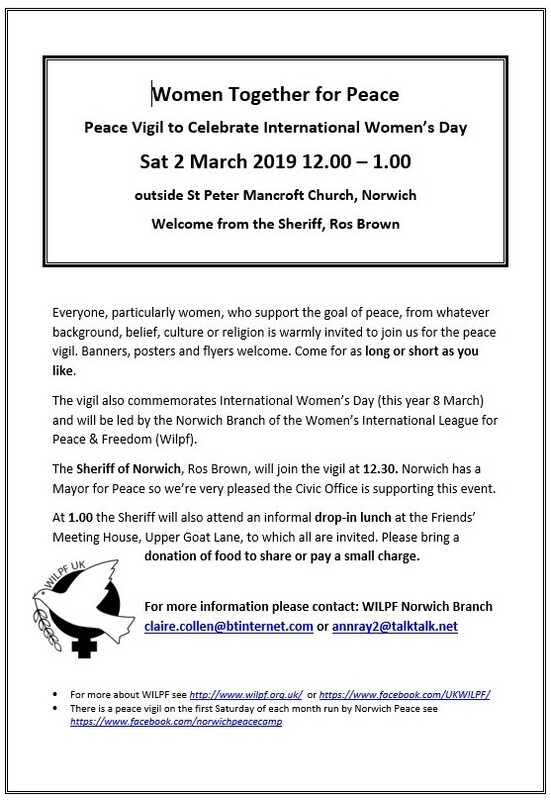 The vigil also commemorates International Women’s Day (this year 8 March) and will be led by the Norwich Branch of the Women’s International League for Peace &amp; Freedom (WILPF). The Sheriff of Norwich, Ros Brown, will join the vigil at 12.30. Norwich has a Mayor for Peace so we’re very pleased the Civic Office is supporting this event too. At 1.00 the Sheriff will also attend an informal drop-in lunch at the Friends’ Meeting House, Upper Goat Lane, to which all are invited. Please bring a donation of food to share or pay a small charge. 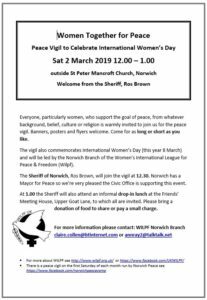 For more information please contact: WILPF Norwich Branch at claire.collen@btinternet.com or annray2@talktalk.net.